- Sari Colt on 六月 23, 2016. ICFF 2016 (Italian Contemporary Film Festival 2016) wrapped up a successful year of presenting Italian films in Toronto, Vaughan, Hamilton, Quebec City, Niagara, and Montreal. The ICFF Closing Party was held at the Ritz Carlton Hotel in Toronto on June 17, after the screening of Giuseppe Tornatore‘s film, “The Correspondence” at the TIFF Bell Lightbox. 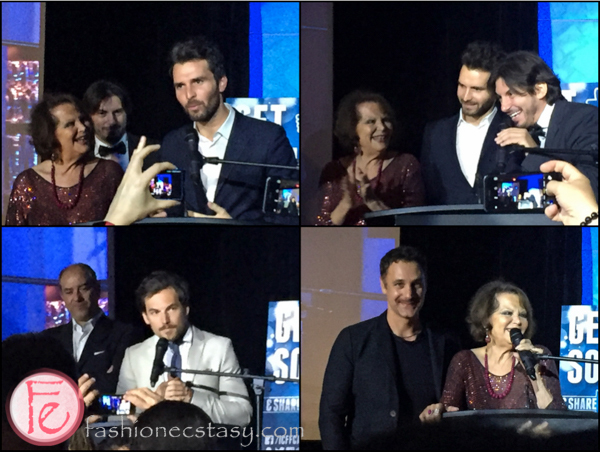 There was plenty to celebrate with ICFF 2016 award winners Andrea Iervolino, Claudia Cardinale, Raoul Bova and Giacomo Gianniotti. Andrea Iervolino (founder and partner of AMBI/AIC) was the recipient of two awards: Best Producer, for his film “All Roads Lead to Rome,” which stars Raoul Bova, Claudia Cardinale, and Sarah Jessica Parker and the Honour of Recognition award as the Ambassador of Italian Cinema in the World. This award recognizes individuals who support Italian contemporary film productions both in Canada and internationally and who work on building stronger ties between Canada and Italy. Iervolino has produced, distributed and financed over 40 films. Legendary actress, Claudia Cardinale, received the Lifetime Achievement Award for her work in film. She has appeared in over 110 films and is known worldwide for her classics such as Fellini’s “8 1/2,” “Once Upon a Time in the West,” “The Pink Panther,” and “Fitzcarraldo.” Since March 2000, Cardinale has been a UNESCO goodwill ambassador for the Defense of Women’s Rights. Canadian actor Giacomo Gianniotti received the Next-Generation Award of Excellence for his work in television on “Grey’s Anatomy,” “Reign” and “Murdoch Mysteries”. Giulia Di Battista and Gloria Kurnik‘s “Resce La Lune” won the Best Short Film Award. Gabriele Salvatores‘ “Il Ragazzo Invisibile” and Marcello Ponte and Paolo Tripodi‘s “Asino Vola (Donkey Flies)” won awards for best children’s films of ICFF Junior. Gennaro Nunziante‘s “Quo Vado?,” which opened this year’s festival and starred Checco Zalone, received the People’s Choice Award for Best Film. Gabriele Mainetti’s “They Called Me Jeeg Robot” was voted by The Toronto Film Critics Association as the Best Film at ICFF 2016. David Rocco and Chef Massimo Capra were also in attendance at the closing night party. During the cocktail hour, guests tasted Galbani cheeses with antipastos and Gabbiano wines. The Ritz-Carlton provided food stations throughout the main ballroom, offering roast beef, pasta bars, antipasto stations, and a never ending dessert table. The party was non-stop and put the perfect ending to this year’s Italian Contemporary Film Festival / ICFF 2016.